Like to Eat Better This Year? My Irishman and I were talking about the secrets to happiness last night. We both agreed that gratitude and, as Massive Attack put it, ‘being thankful for what you’ve got‘ is super important. Which is why I’m sitting at my computer now thinking about how lucky I am. All the reasons I have to be thankful. One of those is my work. I love what I do. And even better than the fact that ‘cooking’ and ‘eating’ are ‘key result areas’ in my job description, I actually get to help people enjoy all the goodness that comes from eating delicious, real, home made food. Sherrill, Soupstones Meal Plans Member. “Prior to joining Soupstones I had determined that …once again… something needed to be done about my weight. Other than chubby, I’m quite healthy with much thanks given to the genetics that have pretty much overridden my self-abuse. And, seeing as how I recently became a member of the 65-year old community, figured this is a last hurrah to really enjoy feeling, being and looking well. Intrigued by Soupstones and Jules’s ever-growing, non-preachy beliefs about eating, I initially purchased one of her e-cookbooks, eventually becoming a member of the Weekly Meal Plan “club”. Jules’s recipes, philosophy, research, weekly e-mails and general chattiness continually feed and stoke the fires of my becoming more mindful, educated/questioning and cooking creatively. In addition, shopping with the Meal Plan lists makes cooking sooooo much easier while at the same time helping cut food and money waste way back. As a single person, I am particularly happy to move from the 20-ingredient, calorie-laden, 4-to-6 servings meal to a 5-items-or less, healthy meal for two. Having always considered myself to be a good food eater [while eating too much of that good thing!] even some of the small changes [Cauliflower Rice or Zucchini Pasta] are really satisfying substitutes. Combining Soupstones Meal Plans and Recipes with a new, regular exercise program has had the extra added benefit of making me even healthier — and 25 pounds [1.78 stone] lighter!!! 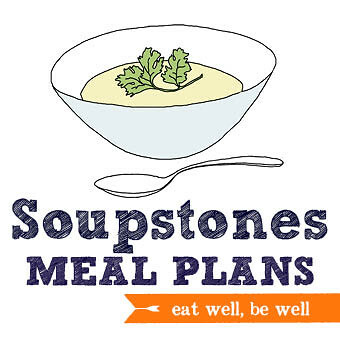 To celebrate the 3rd Birthday of Soupstones Meal Plans, I’m having a quick 50% OFF Sale. Bacon and cabbage is one of my favourite food combos. Up there with tomatoes and basil or fish and lemon. I love it cooked as a meal on it’s own but this soup makes for an even more comforting treat. 1. Heat a large saucepan on a medium high heat. Add a little oil and your bacon and cook, uncovered, stirring every now and then for 5 minutes or until the bacon is crispy. 2. Remove bacon from the pan, leaving behind the oil. 3. Pop your onion in the pan (add more oil if you think it needs it). Cover and cook, stirring periodically until the onion is soft and golden. About 10 minutes. 4. While the onion is cooking finely slice your cabbage. Then add to the pot when your onion is soft. 5. Add stock and bring to a simmer. Cook, uncovered until the cabbage is no longer crunchy – around 15 minutes. 6. Remove from the heat. Add 2 tablespoons vinegar. Taste and season with extra vinegar, salt and pepper as needed. Remember you’re going to serve with salty bacon and cheese. 7. Divide soup between two bowls. Top with parmesan and bacon. 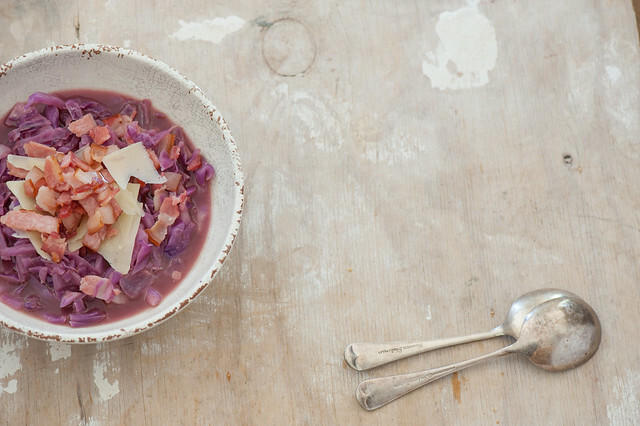 5-ingredients – either skip the parmesan or use water instead of the stock. short on time – use two pots and cook the bacon at the same time as the onion – will save you 10 minutes. 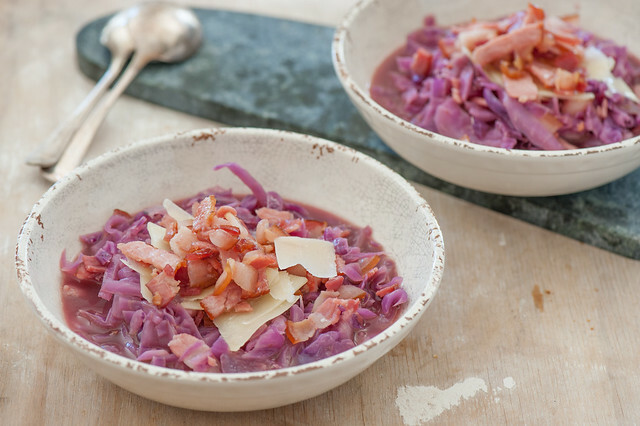 vegetarian – double the onion, use vegetable stock, skip the bacon and use lots of parmesan. Add some cooked lentils or beans to make it more substantial. more substantial / high fat – serve with a big dollop of home made garlicky mayo or top with a poached egg. more substantial / carb lovers – toss in cooked pasta or serve with hot buttered sourdough toast. Or better yet some Irish soda bread buttered with Kerrygold. herby – add some rosemary, sage or thyme with the cabbage. different veg – try with kale, collard greens, spinach, or chard. different pork products – crumbled pork sausages, sliced chorizo or salami would all work. And the birthday sale ends in less than 48 hours! I had subscribe to the meal plans and unfortunately had to cancel because they did not work for my eating lifestyle. As a vegan who does not like to cook, there weren’t enough you get options and some of the recipes were far more complicated than I was willing/able to handle. I love your five ingredient cook book. And I love that in your recipes you give various options which usually include a vegetarian or vegan option. So I am still a huge fan and I would definitely recommend the meal plans to anyone who doesn’t have my eating restrictions. Here’s my suggestion would it be possible for you to offer an alternative meal plan for vegetarians or vegans or and bad cooks I eat five ingredients or less. Because you So many options I think it might be doable without too much work. I don’t know how much of your base includes people like me so it may not be worth your while but as you grow your company perhaps that could be an option? I know if it was I would definitely be signing up again. Thanks for the feedback Andrea! Doing it I was a bit skeptic it would be tasty but actually, in the end, the mixture of vinegar, bacon and parmesan with the cabbage was wonderful.